Here’s a photo from Morgans Hill that I took back in July of a female Essex Skipper Thymelicus lineola. Followers in North America may recognise this butterfly as the European Skipper. 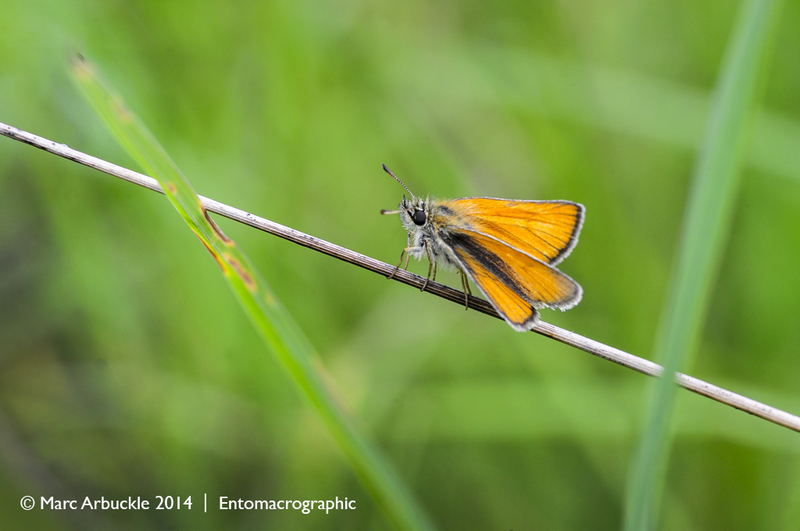 It closely resembles our Small Skipper Thymelicus sylvestris which it is often found in company with, but that species lacks the black tips to its antenna. Because of the similarities, it is often under-recorded and for this reason was not recognised as a separate species until 1889. As such it was the last British resident species to be described. It favours tall, dry grassland in open sunny situations, but can often be found on roadside verges. The caterpillars feed on on a range of grasses but rarely Yorshire-fog Holcus lanatus the preferred foodplant of the Small Skipper. Despite its name it’s not confined to Essex and is found over much of southern England. In the past couple of decades it has steadily increased its range perhaps assisted by the steep grass-covered embankments often found along the edge of major roads and motorways. These man-made corridors may well have helped this species to colonise new areas more easily. Thanks Michael. Not many insects to photograph at the moment. It’s too cold.